​Since 1975, Uptown Frames has been providing museum quality custom framing to the New Orleans Metro area. We offer unique and creative picture framing designs to showcase and preserve your memories and heirlooms. Today, our client base extends way beyond our community, providing both residential & corporate clients with superior customer service and impeccable artistic design. Our knowledgeable designers work with you to ensure you receive a product that is of exceptional quality and tastefully designed. A large scale mirror framed by Uptown Frames for the home of Tracy Gielbert was recently showcased in the Spring 2017 edition of New Orleans Homes & Lifestyles magazine. "Right: The entryway as seen from the dining room. Photograph by Dutch artist Suzanne Jongmans (Jongmans Gallery Wilms Netherlands) is a playful nod to Tracy Gielbert’s heritage. Mirror was custom made by Uptown Frames." You can follow our most recent work on Instagram! Did you know that Uptown Frames provides professional picture hanging services? Whether it is for an office, business or home...there is no job too small! ​Contact us at 504-866-1576 to schedule an installation. We offer commercial custom picture framing services for businesses large and small in the New Orleans area. 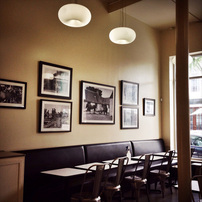 Some of our commercial work is on display at Maple Street Patisserie et Deli in the Garden District.